[QTS 4.1.1 Build 0916] For TS-x10, TS-x12, TS-x19, TS-x20, TS-x21, TS-x39, SS-x39, TS-x59, TS-x69, TS-x70, TVS-x70, TS-x79, TS-x80, TS-509, TS-809/809U, HS-210 and IS-400 series. - Updated Twonky Server to version 7. - Add SMB protocol option: Only allows applications to access files using the long file name format. - Added the VPN client IP column in “VPN Server” > “Connection List”. - Enabled email notifications when the RTRR job status changes from “retry” to “standby”. - Files can be deleted from File Station using the keyboard's Delete key. - Added a “View last run log” button in “Antivirus” > “Scan jobs”. - For files that are being transcoded and added in “Transcode Management” > “Background Transcoding Task”, the option to select resolutions that are already available is disabled. - Added a promotion banner in “App Center” > “All Apps” and “Developer Contact Information” in the app property. - Added the “Slideshow” button in Photo Station to play all of the selected photos in an album. - Added support for downloading resized photos in the Photo Station. - Added the “Copy to Clipboard” button in the Share window in Video Station. - File Station can now display up to 500 items. - “Year” in the Timeline view can now be clicked to show all of the photos in the year clicked in Photo Station. - Intermediate SSL Certificates are now supported. - The QTS firmware version can be shown/hidden on the login page using the “show firmware version” option. - External devices can now be auto-ejected after the backup job finishes in Backup Station. - Backup Station can now generate detailed remote replication backup reports. - Folders can now be uploaded in File Station using Google Chrome. - Backup Station can now send users a mission report after a RTRR job is completed or fails. - Storage Manager can now create a system log when the HDD temperature has returned to normal. - Added the stop service button for the Amazon S3 backup service. - Added SSH encryption support for rsync backup. - The /home and /multimedia media folders in Multimedia Management can now be cancelled for folder scans. - Added the option to directly add a shared folder as a media folder during the folder creation process. - Added support of the number of days as a filtering criteria for remote replication. - Added support for restore mode in Quick Installation. - Updated Apache to version 2.2.27 for Web Server. - Increased the length of the user password to more than 16 characters. - USB DACs are now supported in Music Station. - The free space alarm can now be more than 99999MB in Hardware. - Includes iSCSI LUNs in disk usage in both System Status and Dashboard. - Includes Wi-Fi in both Network Status and Dashboard. - Added support for setting the daily check time in the Recycle Bin setup. - Includes Selfhost.de as a DDNS service provider. - Added support for sleep mode in Power Schedule. “Manual Scan” (for ARM models). - Only shows the CPU temperature in “System Status” > “Hardware Information”. - The default transcoding resolution option in File Station has been changed from both 360p and 720p to only 360p. - “Folder Monitoring” in Transcode Management has been renamed “Auto Transcoding Folder”. - Cannot join an AD Server if the domain administrator's username includes the character: "-"
- FTP download tasks may stop at 99% in Download Station if the connection has timed out. - Enhanced security by upgrading OpenSSL to 1.0.1h (CVE-2014-0224, CVE-2014-0221, CVE-2014-0195, CVE-2014-0198, CVE-2010-5298, CVE-2014-3470‏) (Not supported in TS-269H yet). - The Turbo NAS will occasionally reboot when transmitting large files via CIFS/SMB. - The Turbo NAS will occasionally reboot when you backup files to an external hard drive. - In VMware ESXi host, the Turbo NAS will reboot if you copy large vmdk files using iSCSI LUN with a SSD cache. - There is a chance of the system freezing if you add a large number of video files to transcode. - Unable to expand a RAID 5 (4 x 3TB disks) to RAID 5 (4 x 4TB disks). The limitation of 8TB for RAID expansion on ARM-based NAS has been removed, and it can now support up to 16TB. - Executing Virtual_Machine_Data_Integrity will break the connection of ESXi and vcenter for TS-x80 and TS-EC-x79-SAS models. - Users can see other users' devices in Qsync when users are logged in as non-administrators. - If you drag & drop a folder with over 100 files in it to the QTS desktop through Google Chrome, only 100 files will be uploaded. - When the Block Zero feature is enabled in VAAI for iSCSI, it will impact performance. - When copying files in iSCSI drives, the Turbo NAS CPU usage will be higher, and may potentially cause a large number of "apache_proxy" processes to run. - The copy speed of iSCSI becomes much slower after a sustained I/O to a hyper-V host. - The volume reclaim function sometimes shows as invalid on the UI, but system logs report it to have succeeded. When it is invalid, the manual reclaim will get the same result. - The TS-269H cannot enable the Media Library. - The Turbo NAS will crash if the users remove the Wi-Fi dongle and reinsert it a few seconds later. - Notes Station will be enabled after reboot after disabling Notes Station in App Center. - Updated PHP to 5.3.29. - [ARM] Fixed the Turbo NAS reboot issue in some network environments by disabling the new high performance mode option. - The file system check will fail if the user expands the Thin Volume to 144TB. - When unplugging a JBOD, the Enclosure Info button is still enabled and clicking the button will show blank content. 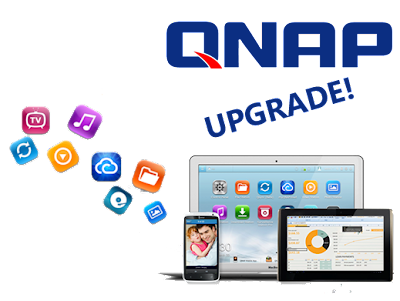 Mas información en la web de QNAP.